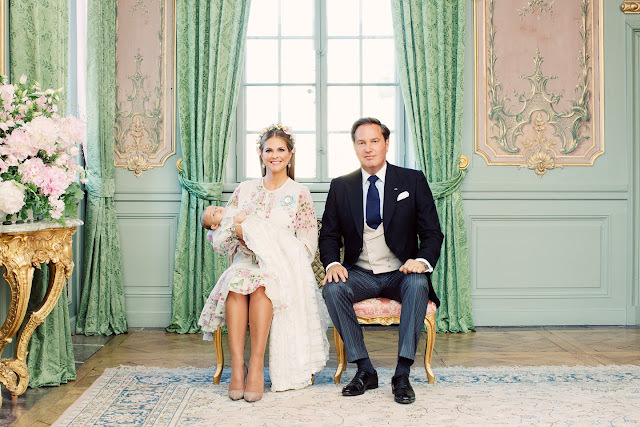 Princess Madeleine and Chris O’Neill celebrated their fifth wedding anniversary today by christening their third child, Princess Adrienne. Check out our open post here, with a link to watch the service. Wee Adrienne grabbed right on to her baby sash of the Order of the Seraphim as soon as King Grandpa tucked it into place, because she knows what’s up. 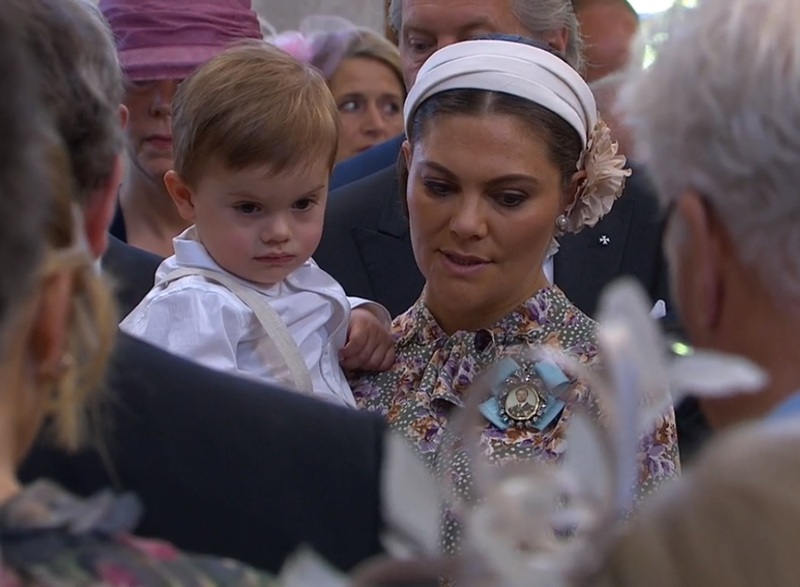 I had no expectations of any major jewel debuts from a christening, which made this even better: Princess Madeleine wore pieces of the Cameo Parure for the first time today! She used the bracelet and the earrings. As a card-carrying member of the Cameo Tiara Fan Club, I now have my fingers crossed for more, because that what’s happens when you give me a little bit. 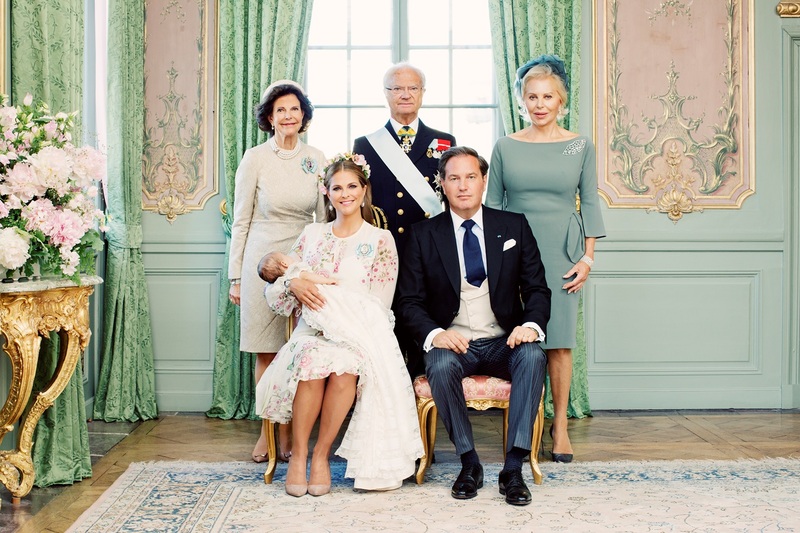 Madeleine and the royal ladies wore their portrait brooches of the King, as usual. The cameo pieces were perfect complements to the cream and gentle pinks of her floral dress by Giambattista Valli (h/t to Heaven). To my surprise, I even enjoyed the touch of flower power in her floral headband...or maybe that's just a little bit of carryover from my cameo delight. 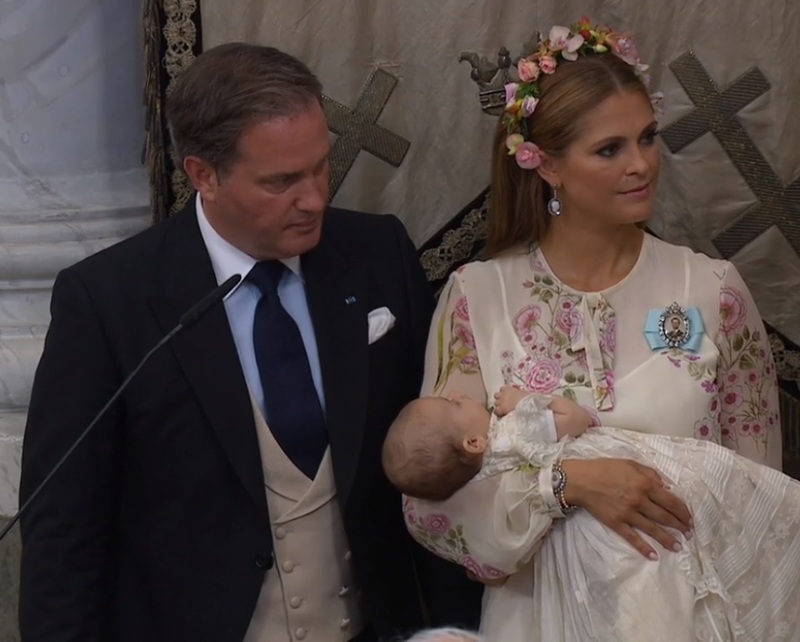 Princess Leonore joined the floral dress brigade led by her mother. She chose to de-accessorize by taking off her shoes. The Swedes let the kids be kids at these events (bless ‘em for allowing the antics), so go ahead and get comfy, girl. 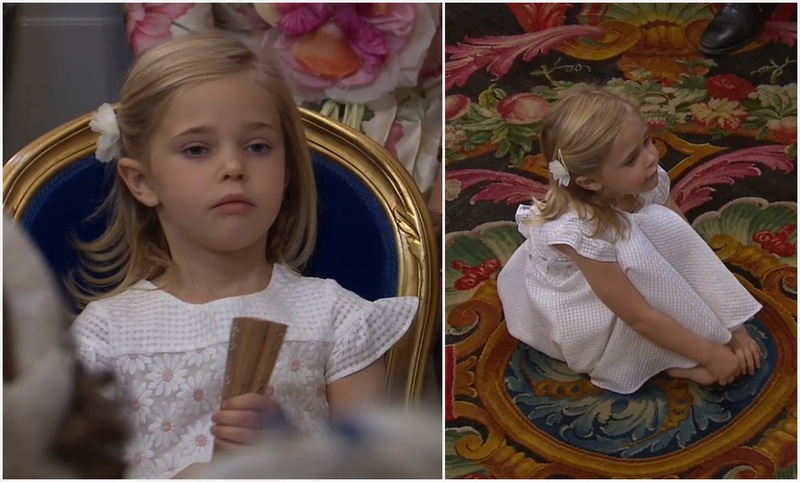 Leonore was without a partner in crime today; Princess Estelle was sick at the last minute and could not attend. 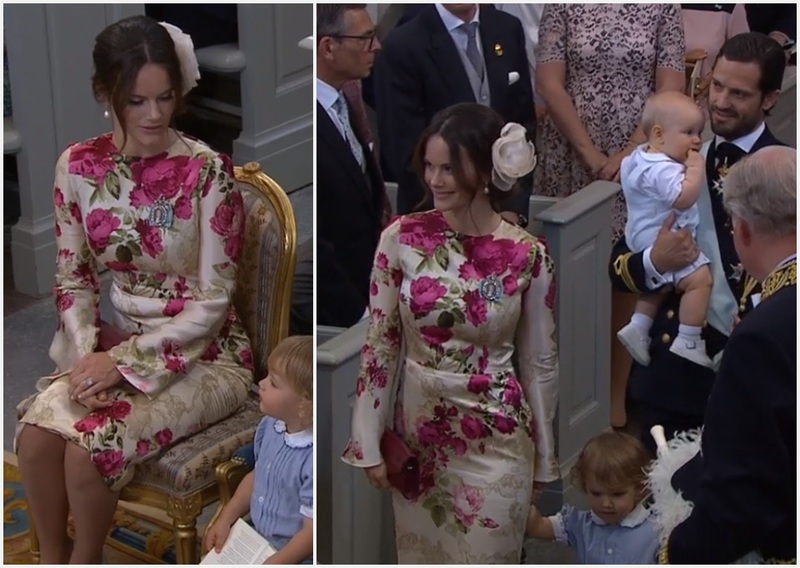 My second favorite floral dress of the day belonged to Princess Sofia, interpreting the day’s pink color scheme in a bolder and sleeker fashion with this Ida Lanto dress. Little wrinkled after sitting through the service, but eh, that's life. If I quibble (and I will), I would have loved to see some more colorful accessories beyond the purse and perhaps more of an actual hat. 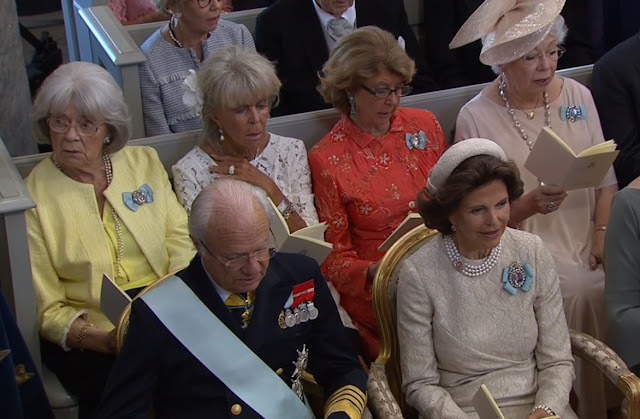 A big ask of any Swedish royal lady at these events, I know. I didn’t really understand her hat pairing, either; then again, I don’t understand her affection for these pile of embroidery hoop hats to start with. This is another version of the hat type she wore to Princess Leonore’s christening, at the time a nod to the headpiece Queen Silvia wore to Prince Carl Philip’s baptism (not the same hat, however). All four of King Carl Gustaf’s sisters were present at the christening; above from left to right behind the King and Queen, Princess Margaretha, Princess Birgitta, Princess Désirée, and Princess Christina. Only Princess Christina hatted up. (Lots of ladies didn’t and that’s par for the course at these events.) When Princess Christina hats up, she tends to hat up; this was sparkly and possibly capable of flight and I loved it. She had to make up for her sisters, after all. One hat to cover them all. 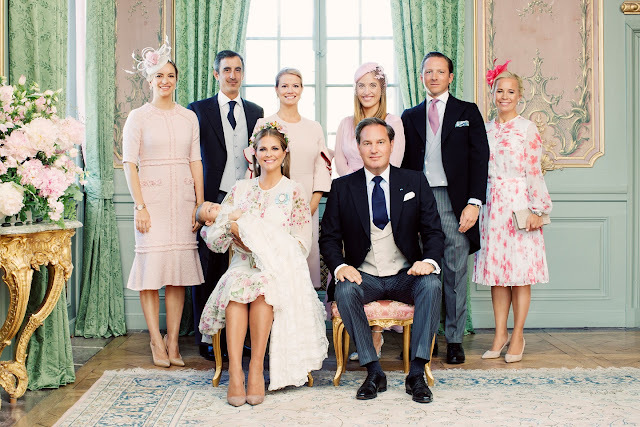 Who takes home your fashion awards for today’s christening?